I’VE BEEN writing about writing for the past eight weeks, so I hope my readers will indulge me this personal break, this little foray into male plumage. You’ll probably notice that, this week, I’m sporting a new picture for this column—the first time I’ve changed it in years. I liked that old picture (taken by Raymund Isaac) and had been using it whenever I was asked for one, but I think the time has come to be honest with myself and my readers and to admit that, well, I just don’t look like that anymore. I’ve grown—and I look—considerably older, though happily also a bit leaner, thanks to my diabetes-induced diet-and-exercise regimen. The most visible change in my new avatar, however, is the hat—one of a few I’ve been regularly wearing over the past year. 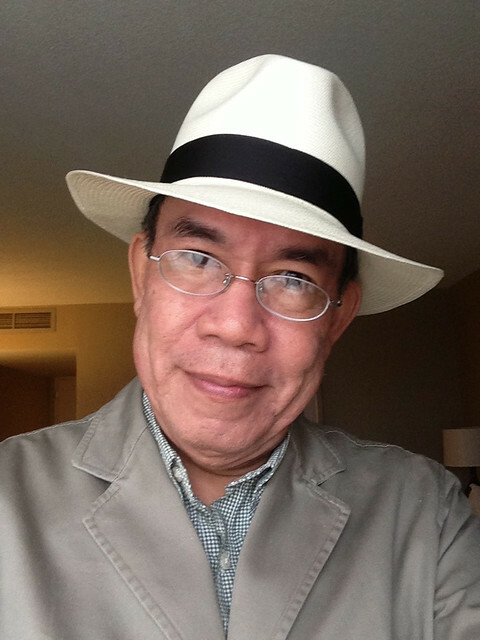 People have been wondering why I’ve adopted what seems to be a foppish affectation—a practice I share with other writer-friends like Rio Almario and Teo Antonio; notably, National Artists Bien Lumbera, Frankie Jose, Bencab, Billy Abueva, and the late NVM Gonzalez have been known to wear hats or caps of one kind or other. I don’t mean to suggest, by citing such exalted company, that wearing a hat will boost my literary stock in any way, although I do hope, in secret, to be taken a little more seriously by dumping all that straw on my balding pate. The fact of the matter is that I’ve been wearing hats for more than 20 years now. 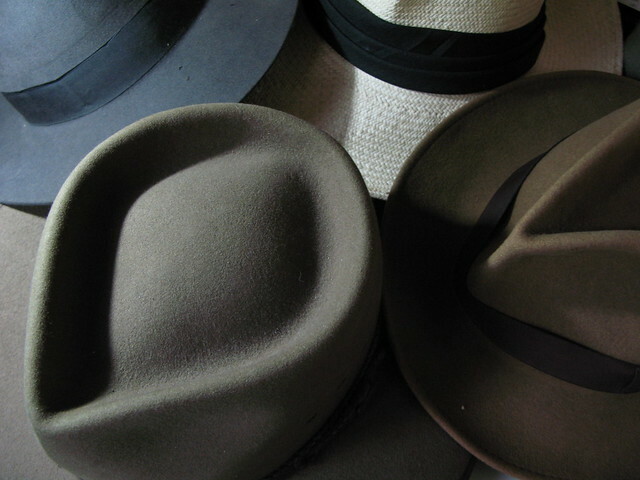 I picked up my first fedora from the Milwaukee Hat Store back in 1989 or so, when I was a graduate student there—and if you know how bitter Midwestern winters can get, you’ll understand that it was more for practical protection than about making a fashion statement. The fashion side came in choosing a felt fedora over a baseball cap, going for a ‘40s or ‘50s look over a ‘90s one (I do keep a small hoard of baseball caps for my morning walks around the campus). I still keep a felt fedora for when I have to travel to the West during the cold months, but here in the steaming tropics, felt (“felt” simply means mashed wool pulp) isn’t too practical, so that a straw panama hat makes more sense. It was one such panama I brought home with me in 1991 when I finished my studies, and I wore that hat to UP graduations for years, until it got lost somewhere. What do I look for in a hat? A sensible profile—nothing that will make me look like a cowboy, a gangster, or a pop star—and good workmanship. Of course, utility is also important. I have a very light, foldable “vineyard hat” for long days in the hot sun—this was the hat I brought to Batanes—because your sweat just wicks off the fabric; another hat, a thicker canvas one called a Tilley Endurable, is beloved of archaeologists, and boasts of being the best hat in the world, made with “British hardware and Canadian persnicketiness.” Another favorite that’s been with me for about 15 years now is an Australian rancher’s rigid felt hat, an Akubra, whose wide brim provides great protection against sun and rain (and against an opponent’s prying eyes at the poker table). But let’s face it: like many of life’s imponderables, in buying hats, attraction trumps function most of the time. Last November, on a trip to Melbourne, I had to kill some time while they cleaned my hotel room prior to check-in, and I found myself wandering off to a nearby shopping center and coming face-to-face with a gorgeous hat in the men’s section—it was made not from the traditional, fine toquilla straw, but the somewhat rougher raffia, and it was woven not in Ecuador but Bangladesh, but it was handsomely blocked, and sat perfectly on my head when I tried it, like Napoleon’s crown. A peek at the price tag made me shudder and I put it back on the shelf immediately, and walked out to a balmy Melbourne morning; but the balmier the morning became, the more I convinced myself that a hat was the best and most practical Australian souvenir I could bring home, even if my trip had barely begun, and within the hour I was back in the store, forking over a plastic card for a straw bauble. I still wear that hat most days, alternating it with the whiter toquilla, which is softer and lighter but also much more fragile. (You can’t wear a toquilla panama in the rain.) I realized what a good choice I had made with the raffia hat when I woke up in a hotel room one morning to find the hat completely drenched by an overnight drip from the airconditioner above; a few hours’ drying, and it was good as new. I often wonder when and why we Pinoys stopped wearing hats, in this eminently hat-friendly weather; if you take a look at any street scene from the 1930s, you’ll see Filipino men, rich and poor alike, wearing hats. Here and there—in places like Baliuag and Lucban—you can still buy a good locally made hat, but we have a long way to go to catch up with the weavers of Montecristi and Cuenca. With cheap Chinese-made baseball caps in abundance, I’m sure not too many people care. That’s all right—I’ll just keep wearing my silly hat to my senior’s sickbed, then tip it to my nurse when the time comes. LAST WEEK, I realized another lifelong dream. Nearing 60, I’ve had the privilege of traipsing all over the planet, but I’d never been to Batanes, the northern spearpoint of our vast archipelago. The occasion was a seminar held by the National Commission for Culture and the Arts, specifically its Literary Arts committee, for the province’s teachers and writers on the development of local and regional literature. 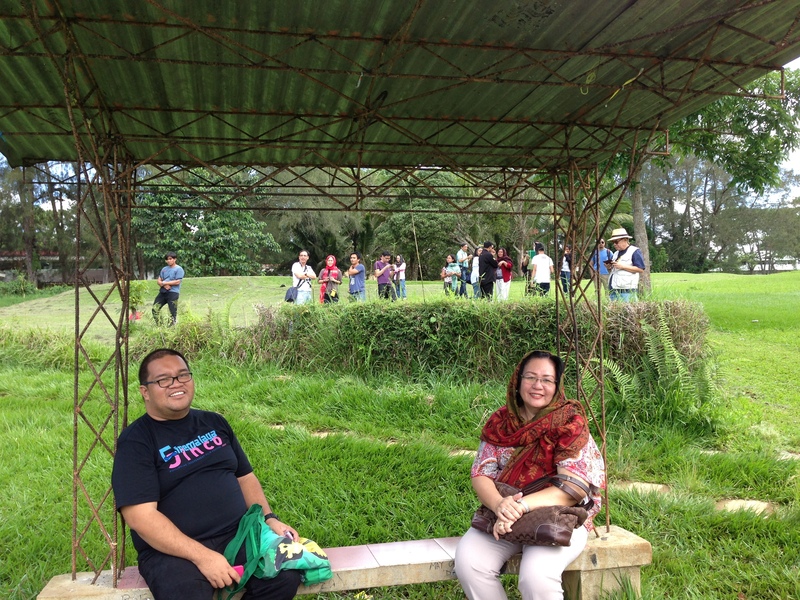 Truth to tell, we went there less to teach than to learn, so remote and strange was Batanes to me and my fellow committee members, who had come from as far down south as Zamboanga. I can’t pretend to have discovered everything good and bad about Batanes in the few days we spent there, but we saw and heard enough to make us want to both rejoice and, occasionally, shake our heads in anger and sadness. 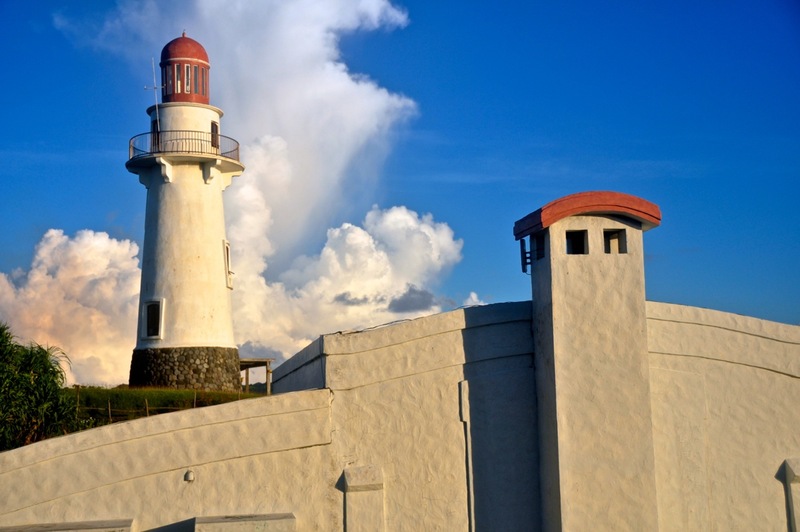 Happily there’s much, much more to celebrate about Batanes than to mourn. “Breathtaking” is almost an understatement for this cluster of islands. If there was such a thing as “panoramania,” or landscape overload, Batanes would be the cause of it, with seemingly endless and unfailingly spectacular views coming one after the other, just around the bend. The greenery covering the undulating hills is marked by a latticework of hedgerows, which act both as property boundary markers and as windbreakers. Despite the many first-class concrete roads beribboning the islands, Batanes is still clearly 4X4 country, better suited for cattle and goats than people, and no Batanes landscape would be complete without a cow or two in the picture, grazing placidly away even on the steepest of hillsides. Nearly everything on the main island of Batan happens in the shadow of the cloud-capped, 1,009-meter Mt. Iraya, although it should be fairly easy to find an undisturbed corner in one of the many coves around the island. You can find those words on one of the most useful and inexpensive PR giveaways I’ve come across, handed to us by Mayor Demy’s staff: a cardboard fan shaped like a kavaya, the leaf of the breadfruit tree, which the local people use as plates and food wrappers. Practical to begin with because of the withering heat, the fan was also very informative, in that it contained interesting facts about Basco—among them, that the population of the entire province is just somewhere above 16,000, half of whom live in Basco. The fan also highlighted Basco’s and Batan Island’s major tourist attractions. Only in his mid-thirties, the poetically gifted Demy Marag is a Broadcast Communication graduate from UP; after graduation in 1998, he worked in the industry and with an NGO for a few years before eventually answering the calling that lodged his grandfather in the governor’s office decades earlier. A big sign just outside the municipal hall posts the mayor’s cell phone number and those of other key municipal offices; you can call them anytime. Now on his last term, Demy says that his biggest headache in Basco is zoning, with new buildings cropping up all over town, likely in response to the surge in tourism and commerce. 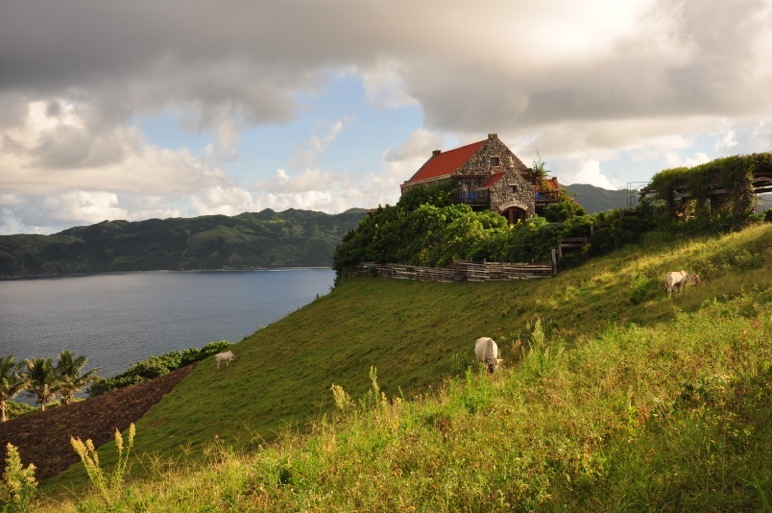 There are, of course, many other problems a remote province like Batanes has to contend with. Over a light merienda at the impossibly picturesque (had enough of these superlatives yet?) Fundacion Pacita, Basco’s energetic vice mayor, Ann Viola, explained how the typical Batanes resident, though not wealthy, was basically self-sufficient, producing enough for oneself and one’s family through fishing and farming. (You can appreciate this wiry self-containment in the fact that you’d be hard put to find an obese or even chubby Ivatan, and they don’t look emaciated, either.) Since transport costs are prohibitively high, producing goods for export poses a huge problem. Indeed, there’s literally a price to pay for all that glorious isolation: a liter of gas costs P70—which was cheap, said our guide, considering that it had shot up to P150 at some point a year ago. Bewilderingly, there are hardly any fresh fruits to be found in Basco—no bananas, pineapples, star apples, or jackfruit—and the only fruit that kept turning up on the dessert tray was the obviously imported apple, very likely from nearby Taiwan, which is closer to Batanes than much of the rest of the Philippines. Tourism should be the province’s logical economic booster, and good, affordable bed-and-breakfast places like the Amboy Hometel, where we stayed, can be found. (For those with more elastic budgets, the Fundacion Pacita is a matchless choice.) Tours by van are readily available, taking you to the best spots—the Vayang rolling hills, the boulder-strewn Valugan beach, and the lighthouse on Naidi Hill, among many others. A day trip to nearby Sabtang Island, just half-an-hour away by ferry, is also well worth it, particularly for the stone houses of Savidug. It’s getting there that’s the big hurdle for most people. PAL Express and SkyJet fly three times a week from Manila to Basco, and a local airline called NorthSky makes a hop to Cagayan, but flights are sometimes canceled for lack of passengers. Only cargo vessels now dock in the harbor. As a regular one-way plane ticket to Manila costs about P9,000, a Basco native could spend his or her whole life without ever stepping on Luzon. “If you have a medical emergency and can’t be treated here, or airlifted to Manila, you’ll die,” said the vice mayor. Another problem is the pernicious presence of poachers from Taiwan, who come down to the islands to steal the pretty arius tree, which they use for bonsai, and also fish the waters using state-of-the-art detectors—intrusions against which the local fishermen and Coast Guard are no match. It’s too bad that these criminal acts should spoil the relationship between Batanes and Taiwan, whose people—linguistically, for one—have much in common. My message for the teachers and writers of Batanes was the same one I gave at the closing ceremonies of the recent Iligan National Writers Workshop. I was, I told them, an island boy, and proudly so—I was delivered by a midwife a short walk from the water’s edge in an island in Romblon, in a house with a straw roof and a bamboo-slat floor—and we Filipinos, come to think of it, all live on islands, some of them just bigger than others. 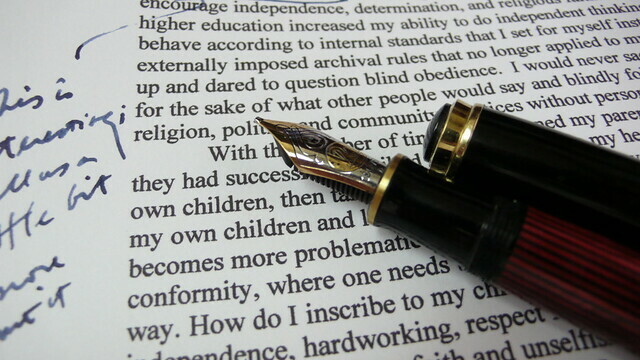 But the challenge to our writers and teachers is to help us become more than a collection of islands. Our writers have to find and emphasize what we share in common as a people, even as we celebrate the things that make us unique. By building a bridge of words, Batanes can come much closer to the rest of the country. I’d like to thank our guides—Chriz Annmarie Bayaras and Juliet Gulaga of the Batanes Heritage Foundation, Inc.—for a most productive week. SPEAKING OF Iligan, MSU-Iligan Institute of Technology is capably led by Chancellor Sukarno Tanggol, a public-administration expert and another UP graduate who chose to return to his roots in Mindanao after serving as Ambassador to Kuwait to help raise the quality of education there. Dr. Tanggol recalled, jokingly, how he had lost all his poems and therefore his literary ambitions when his laptop got stolen years ago, but he’s making up for that by pledging his strong support for cultural programs in MSU-IIT, most notably the writers’ workshop and the institute’s resident performing company, IPAG. The wonderful thing about attending a region-based workshop like Iligan’s is being able to listen to commentary and criticism in a flurry of languages—Filipino, English, Cebuano, Hiligaynon, and even more obscure ones like Higaunon (spoken in parts of Bukidnon)—and somehow, with some effort and patience—to make sense of it all. This is the nation in progress, the nation at work, rightly de-centered from Manila, celebrating the vibrancy and vitality of literary talent beyond the metropolitan mainstream. A fantastic discovery in Iligan was the talent of a young Higaunon poet named Shem Linohon from Central Mindanao University. Though perfectly fluent in English, Shem has chosen to write in Higaunon, to help preserve his people’s language and experience. At one point, Shem broke down in tears as he recalled the depredations his people have had to go through at the hands of oppressors and landgrabbers; but more than anger, Shem has the skill with which to fight back, and we can only wish him and his people well. Another happy find was Carmie Flor Ortego of Leyte Normal University, who can write about a Homeric character like Penelope in Catbalogan. Bright and earnest, young writers like Shem and Carmie make me proud and happy to be a teacher of writing.